If you watched enough Youtube makeup videos and read enough makeup blogs, you probably mastered the art of creating defined crease or how to create fake crease from scracth. Aside from makeup, we can also create fake crease or defined crease with the help of eyelid tape or glue. (Ex. K-Palette Real Lasting Mega Cute Double Eyelid Glue and Tape) Some of you may think the effect could be unnatural or it is just too much of a hassle to apply, TADAH! 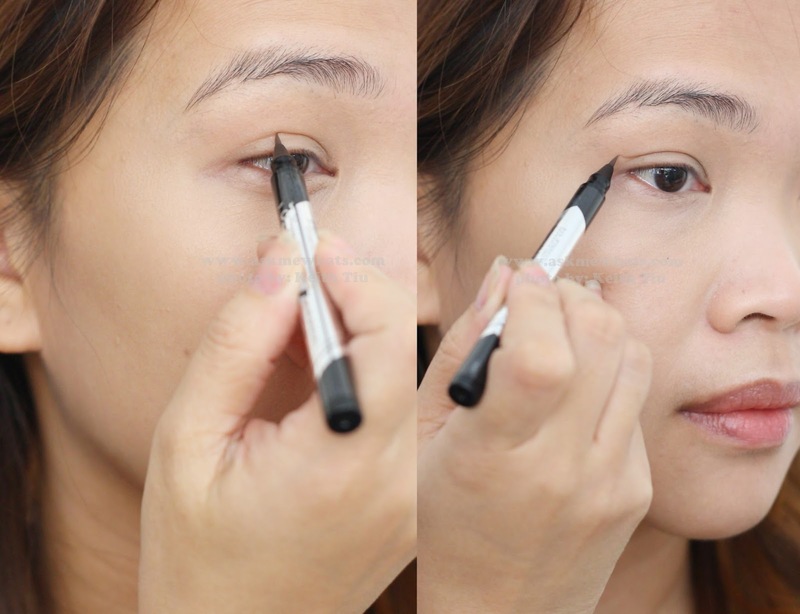 I'm sharing one of the EASIEST way to define your crease with just a SINGLE STROKE! Hail to KATE Double Eyelid Remake Liner! When I first got this, I almost tossed this aside because who would like to draw a fake line on top of your current crease? The effect will definitely be a major "makeup disaster". So just for fun, I "Snapped" (using SnapChat) a video of me using this for the first time. And I was floored!!! Now before sharing photos, let me start by sharing more details about the product. Kate Double Eyelid Remake Liner is a "Secret Shadow" Color eyeliner that gives out a faint brown line for drawing lines to create double eyelids. So I assume this is perfect even for users who are monolided. The comes in an easy-to-draw pen-type packaging just like our favorite liquid liners. They came up with only ONE shade called Faint Brown (LB-1). With that as a possible "con", I find this shade to be a perfect universal shade to create "shadow" on your eyelids. For reference, I already have a defined crease, for the sake of review, I actually draw a line on top of my existing crase and extended the tail with a short flick. Even with 2 swipe, you get a very natural ash brown tone. It may look obvious if you close your eyes but once you apply a small amount of eye shadow, the define line will disappear. Kate Tokyo highly recommend to also use the same pen and add a line below the lower eyelid and spread with fingertip to make it appear like shadow for a "plumper eye look". I'd rather give this a skip because I have enough "plump" and bags on my lower lid. Since I don't have eye makeup on, I am happy with just defining my existing crease + extending the line of my crease. If I have full make up on, I can actually extend the line of my eyes! Kate Double Eyelid Remake Liner is not an important makeup product to invest on but after trying this out, it is actually lovely to have! I am actually having fun applying this before and after eye makeup application for an extra "oomph"! How do you find the new innovation from Kate Tokyo? Will you wear this look (photo above) on a daily basis? It's a very subtle difference but it's actually quite nice. It's not a 'can't-sleep-want-now' kind of thing but I guess some eyeshapes would actually benefit from it. hahaha I actually am starting to love it! ahahahah yup especially if you don't have eyeshadow! Oh my gosh, may chance na magpantay ang eyelid crease ko! Hahaha! hahahah Mommy Roxi! you are funny!